We normally deliver our shepherd's huts on the back of a trailer with our trusty Land Rover. Sometimes though we have to find ingenious ways to deliver a hut to the exact location our clients require. One such story started in May this year when Sherry & Paul in Yorkshire told us they wanted a Yorkshire Hut Company shepherd's hut to be made and delivered to their home as an office, a unique extra living space and guest room. They warned us that access to their back garden was only possible over an 8ft wall. So when it came to delivery this Autumn we arranged for delivery with a lorry with a hydraulic arm to get over that 8ft wall. 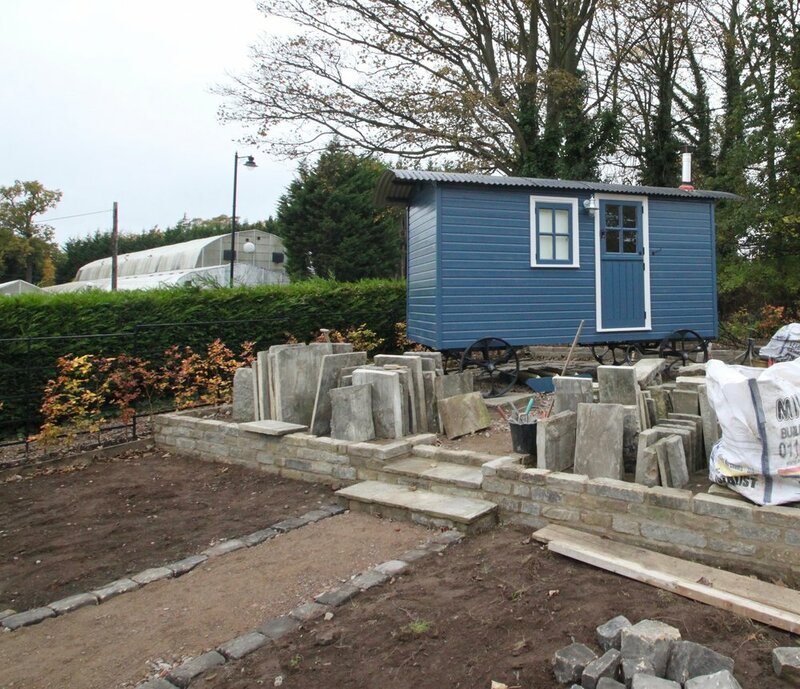 Sherry and Paul were also having a garden makeover to give their hut a beautiful location to live in, so we had to make sure it landed in exactly the right place before being placed upon and fitted to its chassis and wheels. A crowd gathered to watch a 7' x 14' shepherd's hut weighing around 1.5 tonnes in weight, fly through the air and land precisely upon a base of Yorkshire stone. We took some photographs of the whole event and will be updating this story when the garden makeover is complete and the hut has settled in fully in its new location. Shepherd's hut goes over the wall. Awaiting it's first guest and planting... more soon.